The viewer's guide for South Korean politics continues! Part II of this series will take a look at South Korea's political parties and what they stand for. Now is a tricky time to write this post, because political parties in South Korea are going through a once-a-generation level of realignment. For the most part, the history of South Korean democracy had two major parties--conservative and liberal--with some minor parties appearing here and there. But the historic impeachment and removal of Park Geun-hye shook up the political picture in Korea like no other recent events. Given this, the best way to understand where South Korea's political parties stand is to look at Korea's history of political parties, identify the major strands that flow through, and see how those strands match up with each party. South Korea's democracy began in 1987. South Korean president serves a single five-year term. 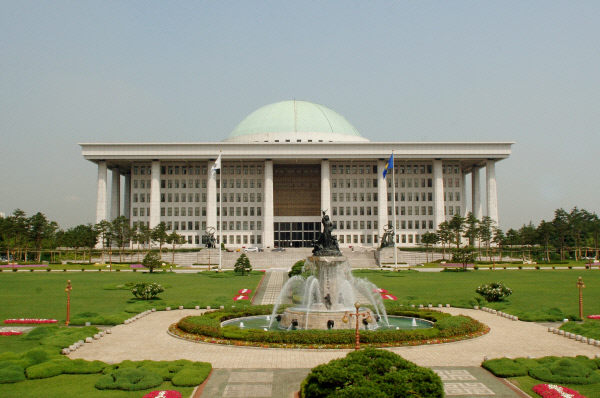 Korea's legislature is called the National Assembly. It is a unicameral body with 300 National Assembly Members. The entire National Assembly goes through an election every four years. For the National Assembly election, a South Korean voter casts two ballots: one vote for her geographical district, and one vote for the party she supports. This leads to two classes of Assembly Members: 253 "regional members," and 47 "national members." In Korea, being a meaningful political party means having at least one seat in the National Assembly. (Thus, this post will not discuss Korean political parties that have no legislative representation, such as the Labor Party or the Green Party.) Being a major political party usually means having more than 20 seats, because the National Assembly Act sets the minimum of 20 Assembly Members to form a "negotiation group," which can receive greater budget assistance, have a say in committee assignments, etc. By this standard, South Korea right now has four major parties and two minor parties. From the most conservative to the most liberal, the four major parties are: Liberty Korea Party (93 seats in the Assembly); Bareun Party (33 seats); the People's Party (40 seats); the Democratic Party (119 seats.) Justice Party has six seats in the National Assembly, and Saenuri Party has one seat. There are seven independent Members. Because the names change frequently, even Koreans often don't bother with names, referring instead to "the ruling party" (여당) and "the opposition party" (야당). The best way to understand Korea's political parties, then, is to understand the various factions that each party represents. And the factions are a direct reflection of South Korea's political history. Republic of Korea, informally known as South Korea, was formed in 1948. Although South Korea nominally began as a democracy, it was in fact a U.S.-sponsored dictatorship. The first dictator was Syngman Rhee, who declared himself to be the lifetime president until the popular revolt drove him out after 12 years of rule. The second dictator was Park Chung-hee, a military strongman who ruled for 17 years until he was assassinated. The third dictator was Chun Doo-hwan, another military general who ruled for seven years until he was overthrown in 1987. And since 1987, South Korea has been a democracy. 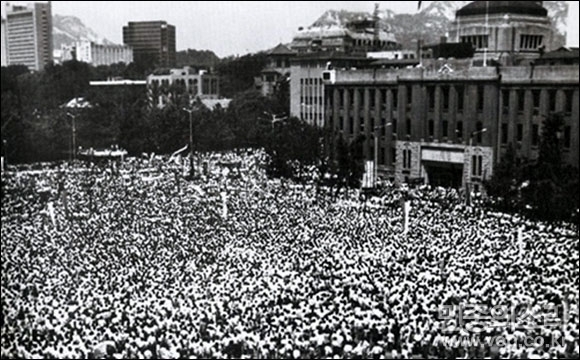 This history means that, in 1987 when South Korean democracy began, there were four major factions within South Korean politics: (1) pro-dictatorship associated with Chun Doo-hwan; (2) pro-dictatorship associated with Park Chung-hee; (3) right-leaning democratization fighters; (4) left-leaning democratization fighters. These four factions would form four parties: Democratic Justice Party, New Democratic Republican Party, Unification Democracy Party, and Peace and Democracy Party--respectively. In 1990, however, the first three merged into Democratic Liberty Party, which would become the main conservative party. The Peace and Democracy Party would change its name to the New Democratic Alliance, and would become the main liberal party. In the quarter century since the formation of DLP and NDA in 1990, Korean politics basically had a two-party system involving one major conservative party that is an amalgam of former cronies of the dictators and right-leaning democracy fighters, and one major liberal party that covers from center-left to far left. I say "basically" because there have been brief periods during which either there was a minor conservative party (like Liberty Democratic Alliance that existed from 1995 to 2006, mostly made up of former Park Chung-hee cronies) or a minor liberal party (like the Democratic Labor Party that existed from 2000 to 2011, a haven for hard-line labor activists and socialists.) But because these minor parties rarely drive the national politics, a beginner observer of South Korean politics can safely set them aside until she is ready to dig deeper. The next two presidents were liberal. Both were broadly center-left, with slight variations. The first liberal president was Kim Dae-jung, who was closer to the center. The second was Roh Moo-hyun, who was to the left of Kim Dae-jung but still well within the center-left range. Then came another set of two conservative presidents: Lee Myung-bak, from the right-leaning democratization fighters faction (although Lee himself was not much of a democratization fighter,) and Park Geun-hye, who hailed (obviously) from pro-dictatorship faction associated with her father Park Chung-hee. Park Geun-hye, as the leader of Saenuri Party, was elected in 2012, defeating Moon Jae-in of the Democratic United Party. And this takes us to early 2016--moments before the current configuration of Korean political parties was set. Even before the notorious Choi Soon-sil affair, Park Geun-hye's presidency marred by numerous cases of incompetence, disasters and scandals--chief among them the Sewol ferry disaster. Yet Park's support remained steady, throwing the liberals to an internecine squabble. In early 2016, the main liberal party was called the New Politics Alliance for Democracy (NPAD). The word "Alliance" in the name refers to the fact that Ahn Cheol-su, popular independent candidate for the 2012 presidential election, dropped the independence status and joined the main liberal party--which changed its name from Democratic United Party to New Politics Alliance for Democracy to celebrate the occasion. The alliance, however, was not a happy one. About a year and a half after joining the party, Ahn began grumbling about how NPAD was not reforming itself enough to appeal to the centrist voters. (A more cynical take is that Ahn failed to wrest the party's control from Moon Jae-in.) Within NPAD there were two factions: those who were closer to former president Kim Dae-jung, and those who were closer to the former president Roh Moo-hyun. Moon Jae-in, the liberal candidate for 2012, was the leader of the latter faction. As Moon consolidated his hold over his party, the NPAD Assembly Members who belonged to the first faction anointed Ahn as their leader. After an ugly series of public bickering, Ahn Cheol-soo left the NPAD, forming his own People's Party in early 2016 along with the former Kim Dae-jung faction. The People's Party claimed to be a centrist party, which leaned conservative in matters of North Korea and national security while leaning liberal in matters of welfare state and employment. With failure of the "alliance," NPAD again changed its name to the Democratic Party--which was even more tightly controlled by Roh Moo-hyun / Moon Jae-in faction. The liberal split seemed disastrous, as the National Assembly election was only months away. Liberals were in an open panic, fearing that the conservative party might win so big that it might even be able to amend the constitution. But as it turned out, the 2016 National Assembly election was when Park Geun-hye's fortune finally began heading south. Park's Saenuri Party collapsed from 152 seats to 122 seats, relinquishing its status as the majority party. The Democratic Party became the new leader with 123 seats, and the People's Party won expectations-defying 38 seats. Then came the Choi Soon-sil scandal. In the face of the most bizarre corruption scandal in Korean history, nearly half of Saenuri Party Assembly Members voted in favor of impeaching the president from their own party. The right-leaning democratization fighters faction led the mutiny. To them, it was already distasteful that they had belonged to the same party as the former cronies of the dictatorship they fought against--the ridiculous corruption scandal was merely the final straw. 33 former Saenuri Party Members walked out and formed Bareun Party, claiming a new era in conservative politics unburdened by corruption and connections with dictatorship. Saenuri Party then changed its name to Liberty Korea Party. In short, the tumultuous presidency of Park Geun-hye gave rise to two major conservative parties and two major liberal parties. This has never previously happened in the history of South Korean democracy. This, finally, puts us to the array of South Korean political parties today. Below is a brief description of each major and minor party in Korea, in the order of their National Assembly presence. Please note that the description is at a very high level, and somewhat idealistic. In other words, the descriptions are what these parties generally aspire to be. 1. Democratic Party [더불어민주당]. South Korea's main liberal party, with 119 seats in the National Assembly. Broadly center-left, falling on the liberal side of nearly all issues that drive Korea's national politics, (which are discussed in Part I) except perhaps in labor market flexibility. Mostly made up of the former Roh Moo-hyun faction, led by Moon Jae-in. 2. Liberty Korea Party [자유한국당]. The main conservative party, with 93 seats. The mirror image of the Democratic Party, as it falls on the conservative of essentially all issues in Korean politics. Mostly made up of the former Park Geun-hye faction. 3. People's Party [국민의 당]. The secondary liberal party with 40 seats. The People's Party claims to be the more centrist alternative to the Democratic Party when it comes to North Korea policies, while maintaining the liberal stance in domestic issues. Mostly made up of the former Kim Dae-jung faction, led by Ahn Cheol-su. 4. Bareun Party [바른정당]. The secondary conservative party with 33 seats. Bareun Party claims to be the more "reasonable" alternative to the Liberty Korea Party, promising a clean break from Park Geun-hye's legacy of being impeached. Mostly made up of the former Lee Myung-bak faction. 5. Justice Party [정의당]. Far-left / progressive party with six seats. Justice Party claims to be the progressive alternative to the major liberal parties, with greater attention to intersectionality and labor issues. Although it nationally has about 4% support, it tends to be over-represented among young urbanites. 6. Saenuri Party [새누리당]. Far right party with one seat. After the "original" Saenuri Party changed its name into Liberty Korea Party, the right-wing civic groups who truly love dictatorship formed the "new" Saenuri Party, and managed to recruit one Assembly Member. Again, this configuration with four major parties is highly unusual in South Korea, which means there is no guarantee that this configuration will remain this way. Duverger's Law says a single-member, first-past-the post electoral system like South Korea's favors a two-party system. South Korea's experience has been consistent with that. While there have been many minor parties other than the two major parties, only one of those parties--the Liberty Democratic Alliance--managed to be a major party (i.e. greater than 20 seats in the National Assembly,) and that was only for a single election cycle from 1996 to 2000. All of this means: we are in some volatile times, and the snapshot we have right now may not go on for much longer. Keep that in mind as you go on observing South Korean politics. Thank you again for great post! I'm slightly peeved at the lack of attention given to progressive/left-wing parties in Korea - my Korean friend is in Justice Party- but overall, a really solid piece. Compared to Baerun or Liberty Democratic Alliance, progressive/left-wingers are a solid voting block that allowed representation of DLP/UPP/JP on the National Assembly for decades now, so I feel it is a *bit* unjustified to mention them only in passing. On last comment on current arrangement not lasting any longer; I was under the impression that major constitutional revision and electoral reform is likely under next administration, more along the line of European proportional representation, right? Even at its absolute peak, the DLP/UPP/JP line had 13 seats in the Assembly. That's not nearly enough to play a national role. In fact, the only time when the DLP/UPP/JP line drove the national politics might be when Park Geun-hye administration sued to disband the UPP. Constitutional revision is being proposed, but it is very far from a sure thing. Thanks again for such a well written and informative post. It's hard to find good and simple breakdowns like this in English as most of the English Korean news sites seem so biased to their respective parties! Appreciate the hard work you put into this for koreans like me that are more comfortable in English. I can finally have conversations with my die hard Daegu parents about what parties they support and I finally understand why they hated my dirty jeollado ex gf so much! You are an exceptional writer. The elections are regularly discussed in our household with my parents-in-law and it's hard to keep up with the moving pieces. Thanks for clarifying this. I often circulate your pieces to my relatives. Great post! Really helpful and informative.